I never heard of this until 2 weeks ago one of my officemate is looking for this food in 7-11. She told me that a lot of celebritiesare tweeting about this ice cream bar by Selecta. 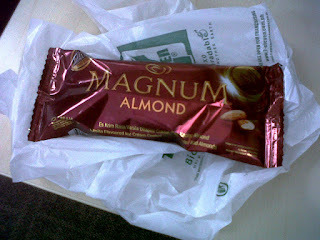 I got curious as well and since I'm craving for something sweet, together we searched the convenience store for Magnum. We were not disappointed except when we have to pay for our purchases...Php 60 per piece for an ice cream bar?! Whoah! So I told myself that I should've get what I paid for. In short, I have high expectations on Magnum. After all, I'll just add Php 100 and I'll get a 1L of ice cream. 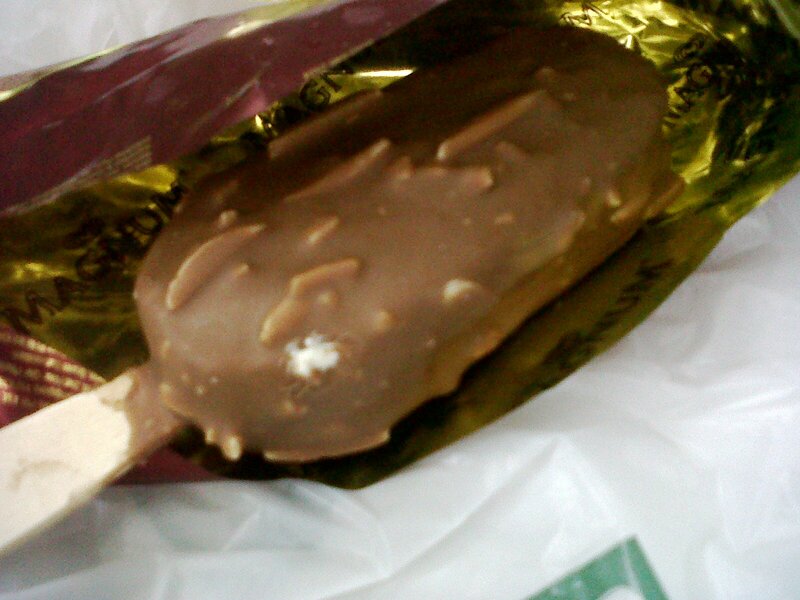 At first bite, the chocolate coating reminds me of Cadbury's chocolate. It tastes the same. My officemate told me that it's belgian chocolate probably one of the reasons why it's quite pricey compared to the popsicles and drumsticks that I'm used to. The ice cream bar itself (the white part) definitely is vanilla flavor. The difference is that it's more milky in taste. Well on my opinion, I can taste the milk and I know that ingredients used in making the ice cream bar is not sacrificed. Will I purchase again? If I'm in the mood to buy one...hehehehe. I'm not really a big fan of ice cream and chocolates so I can survive a week or a month without eating one. On the other hand, my husband will definitely love this! He is a big fan of chocolates. If Selecta will come up with another flavor for Magnum, I'll suggest to make the ice cream bar, strawberry flavored. Hubby will be ecstatic as he loves the most the strawberry-chocolate flavor. 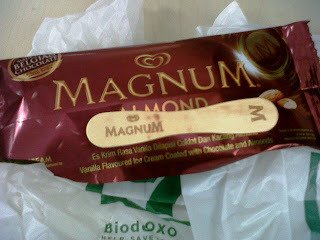 It's delicious, but not with mind-blowing deliciousness to make me buy it again for 50 or 55 pesos. My shallow pockets say ouch! The coating is great but the vanilla is nothing to rave about. If it's endorsed by so many celebrities, then it's not a mystery why the price range is between 50-60 pesos.